Ambiance: A look and feel created for a desired atmosphere. Music, decor, food, drink and fabulous lighting all help create the beloved party ambiance. But in the end, the experience is the people around you! In this regard, it is valuable to communicate dress codes, especially to the fashion-forward and eclectic guests on your invitation list. By encouraging participation in this simplest way you may be surprised at the engaging result that seamlessly adds to the whole joie de vivre that creates an unforgettable Party! When it fits – go for it! ‘Dress-themed’ events are inclusive, good conversation starters and make a fun atmosphere, great photos and memorable times. Black Tie Invited means you have the option of wearing a tuxedo, but it should clue you into the formality of the event, meaning a dark suit and tie would be your other option. Women wear cocktail, long dresses or dressy evening separates. Black Tie means formal. 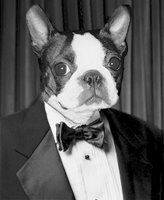 Men wear tuxedos, women wear cocktail, long dresses or dressy evening separates. Formal usually means the same as Black Tie, but in some trendier cities like New York or Los Angeles, it could mean a black shirt, no tie with a tux. Women wear cocktail, long dresses or dressy evening separates. Black Tie Optional means you have the option of wearing a tuxedo, but it should clue you into the formality of the event, meaning a dark suit and tie would be your other option. Creative Black Tie leaves room for trendy interpretations of formal wear. He can go more modern with a tux — maybe a black shirt, no tie. She wears long or short dresses or evening separates (maybe a long lace or sequined skirt with a sleek cashmere sweater). Semi-formal is the trickiest of all dress codes. Usually it means that tuxes are not required, nor are long dresses. An evening wedding (after 6 PM) would still dictate dark suits for him, and a cocktail dress for her. Daytime semi-formal events mean a suit for him and an appropriate short dress or dressy suit for her. Cocktail Attire means short, elegant dresses for her and dark suits for him. Dressy Casual usually means no jeans or shorts. Similar to business casual, but a tad dressier. This entry was posted in Fume and Favour and tagged Dress Codes. Bookmark the permalink.